The test point report is an analysis tool that may ease the administration of the testing points to a great extent by ensuring clarity and possibly the saving of some test points. The test point report may simplify the administration of any testing points significantly. Often, test points are scheduled at different stages of development and by different people. The test point report was implemented in order to guarantee the clarity and arguably a saving of some of the testing points by giving a clear overview about how many and which test points exists per net. In that way it is also very simple to identify nets without any test point. 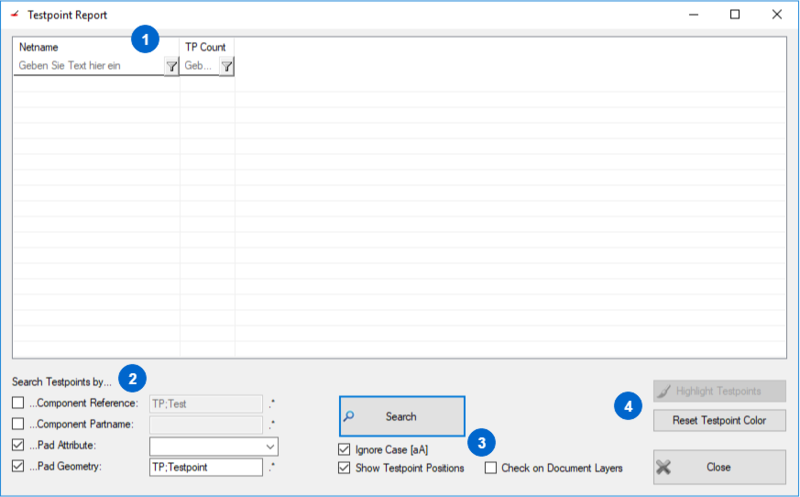 As there doesn´t exist any unique convention for the definition of test points, different search functions have been implemented. The installed search functions don´t exclude each other and can therefore be used at the same time. So, you can activate any search field anytime you want. As the plugin links these search fields with a “or” operation, any enabled search fields are checked. After a search run, the list of results can be sorted. As it is business-dependent, on how and where test points are defined, there are options to search using different criteria. 2.1 You can search for identifiers or the component name (reference). Here, you can also specify more than one identifier. To do so, separate the identifiers with a semicolon (;). 2.2 It is possible to search for the package name. Again, multiple identifiers can be specified. To do this, separate the identifiers with a semicolon (;). 2.3 Furthermore, you can search for copper pads used for testing. Since there is the possibility to set a “pad attribute” in ODB++, you are able to identify testing pads by entering the used attribute name, e.g. the '.test_point' attribute of ODB++. However, this attribute is optional and does not have to be present in your data. 2.4 The last possibility is to search for the geometry of the pads. Again, you can search for multiple pad names at the same time by separating them with a (;). It is possible to differ between upper and lower case. 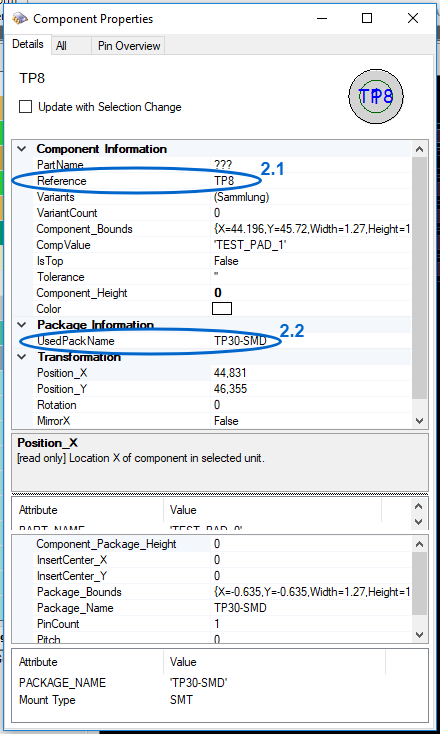 Choosing “Show Testpoint Positions”, the position of the test points is also displayed. You can select “Check on Document Layers”. 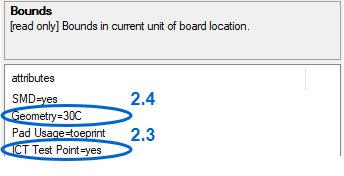 Here, you search for layers on the documents according to the parameters set at ‘2’. Test points can be marked in color and can be deselected.